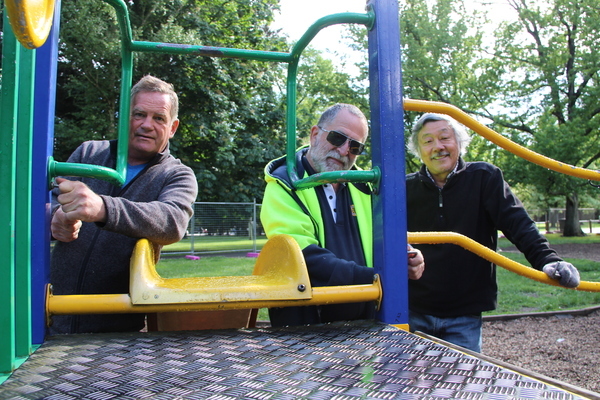 Laurence Webb, Don Fitzgerald and David Lau take the playground apart. An old Healesville playground will soon spread smiles to underprivileged children in Sri Lanka. Rotary Club of Healesville members started dismantling the Queens Park equipment on Thursday 8 November. They’ll pass it on to the Rotary Club of Flemington, who’ll gift it to the Rotary Club of Colombo in Sri Lanka. Healesville Rotarian David Lau explained that the Flemington group searches online for playgrounds facing demolition. They came across the Queens Park redevelopment and reached out to their Healesville counterparts and Yarra Ranges Council. “First we made sure the council was putting up a new playground,” Mr Lau said. He said the old equipment was destined for landfill as it had fallen out of use in terms of child safety. It was assembled with anti-tampering screws so the club had to source specialised tools from Bendigo to take it apart. Meanwhile, Yarra Ranges Council has started constructing the new play space at Queens Park. It will include new playground equipment, landscaping with formal and informal seating, and paths connecting the play space to the existing paths. Fencing has gone up at the site, and the council expects works will be complete by the end of next year. The council is encouraging families to explore play spaces at McKenzie Reserve in Yarra Glen, Coldstream Recreation Reserve, Healesville Railway Station and Melba Park in Lilydale while Queens Park is closed, as well as the water play parks in Seville and at Lillydale Lake. The Queens Park Roll Play bike park is also open.